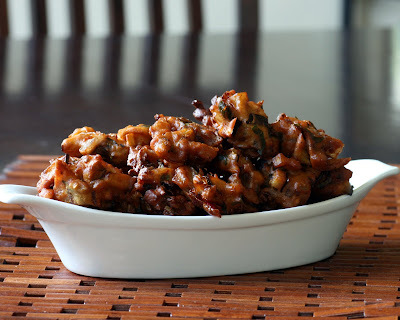 Of course, as soon as I start my new diet Shankar has to go and make these delicious Eggplant Pakodas. The chefmate threw these together as an afternoon snack the other day for Gopi and myself. I swear I only ate two, alright three. As we sat and munched on the pakodas we discussed the virtues of Indian pub fare, and how unfortunate it was for us that we were stuck in a world of fries, wings, and pizza when there was a land of appetizers which included bujjees, pakodas, tikkas, paneer 65, spicy bakshanams and so many others. Shankar and Gopi were going on about how they used to eat all this stuff growing up in India and all I could do was watch them with big eyes and drool at the descriptions. Pakodas can be made with any vegetables, or combinations of them. We typically do them with cauliflower, onion, potato, or eggplant. The key ingredient in this is the curry leaf, it adds so much to the flavor. Guaranteed hit with your friends, but you do have to go to the gym to eat these. 1. Mix all the ingredients together (except the oil). Adding water until you get a consistency where you get a clump of batter that doesn't fall apart. 2. Heat the oil to the appropriate smoke point based on the type of oil you are using. See here for more information regarding that. 3. Drop 2 tablespoon sized clumps of the batter into the oil (not more than 4-5), and fry them on both sides until they are nice and browned. 4. Drain them against a paper towel to remove excess oil. 5. Serve with tamarind and coriander chutney. If you have never deep fried before I recommend reading up on the internet about it. It is important to be very careful when mixing your dough, if there is too much water in your batter making it too loose, you increase the chance of it spluttering out of the oil and burning you very badly. Also if you are reusing oil, the smoke point of the oil decreases with every use, so you must make sure it reaches the correct temperature for frying in order for your pakodas to turn out crispy (otherwise they will be soggy). This site has some very useful information. On Asha's suggestion I am going to send this into RCI: Karnataka! Asha tells me this is a dish that is featured in Kannadiga homes, and they call it Badanekai (Eggplant) Bajji. You could send this to RCI K too. Love the pic of the eggplant pakodas! Nice write up. Makes me want to go to the gym so I can eat all those yummy snacks! Love how the eggplants are lightly coated. Blog's new look is refreshing. Hi kanchana, I agree with you one hundred percent! Nothing to match our food and variety! nice recipe of kathirikai pakoras. Yes, asha is definitely a good friend around! In just 2 months of blogging I can feel the warmth and friendship in her comments! nice idea kanchana! Kanchana, this looks lovely. I am a huge pakora freak and also love aubergines. You have hit all the right tastebuds with this recipe. I've bookmarked it and hope to make it over the weekend! Remember the days when we used to sit around and watch TV eating the tons of pakodas mom made? Now it's your turn to make. Wish we were all there to eat them. That is incredible, you know I tasted them when I was around 10 yrs or so at Mantralayam, that was my forst endeavour with Vankaya pakoda, still I can imagine the flavor...your pakoda looks amazing, thanks for sharing such wonderful finger food! k, indian food is making a strong appearance in pub fare in england. and many brits now eat 'spinach bajjis' with their lunchtime sandwiches instead of fries. egglplant pakoda looks yummy, i love egplants but never used in making pakoda, will try it soon. Never tried pakkodas with egg plant. It is new to me this one. Yum! Yum! Looks delicious, Kanchana! I've not tried to make eggplant fritters at home. And also I don't normally use curry leaves to pakoda batter. I must try it your way. I'm sure it adds a wonderful flavor as well as aroma to the pakodas! The corn bread with jalapenos looks so good, K! As always, LOVE the photography! Have been reaading your posts for a while now. Love your recipes and ideas. Brilliant idea putting up all those JFI and RCI collections on the side bar. Thanks. That will be of great help. Nice looking pakodas Kanchana. Its been a long time I made any bajjis, ohh..how I miss them :(. May be its time for me to try some of those too :). hmmm yum yum. I love these. I make them as bajjis. this is great. Lovely picture! I have aunts who will speak of 'badane' (brinjal) with such fondness! !